Reserve Bank of India has proposed setting up of a national integrated platform for bill payment: Bharat Bill Payment System, a service through which consumers can pay their bills from anytime, anywhere. Within this ambitious plan, nation-wide service providers would be integrated into one single platform of billing. 3 What Consumers Can Expect From BBPS? Currently, more than 3080 crore bills are generated from India’s top 20 cities, amounting to roughly Rs 600,000 crore annually. The problem is that the bill payment system is very scattered and de-centralized. Cash and cheques are still top modes of payment, and fearing that their payment will not materialize, majority of consumers visit the service provider directly to make the payment. The consumer is left to figure out himself how to make bill payments for municipality taxes, phone usage and water connection among hundreds of other bill payments. The whole model of BBPS has been divided into two parts: a) the entity which will operate BBPS, which will be a ‘standard setting body’ and b) Bharat Bill Payment Operating Units (BBPOUs), which would be authorized operational unit set up in urban and rural areas to make the process easier. RBI has made it clear that any entity wishing to operate as BBPS for consumers should be a ‘section 25 company under the Companies Act 1956’ and having net worth of atleast Rs 100 crore. What Consumers Can Expect From BBPS? In the guidelines, RBI has mentioned that the entity which is providing BBPS must earn the trust and confidence of it’s customers by providing an ‘effective, efficient and centralized platform for handling customer grievances and complaints’. A special ‘dispute resolution mechanism’ would be established so that any complains or grievances from service providers, end-users and agents are managed optimally. Hence, atleast theoretically, RBI has ensured that all issues and problems related with bill payment system should be managed in a professional and ‘humane’ manner by the BBPS provider. 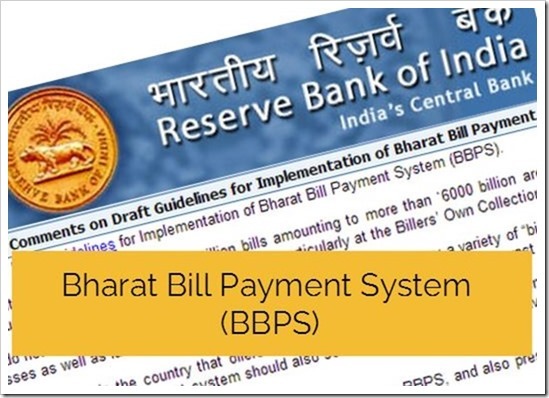 There are still some clarifications required from RBI regarding uniform usage of BBPS; and one such issue is usage of payment gateways to collect bill payments. Earlier we had reported that government is keen to implement Rupay which is government’s official payment gateway. Once BBPS is implemented, they can direct official usage of RuPay for all online transactions. In that case, private companies active in this niche can file for unfair business practices as well. Additionally, there has to be lots of accountability and ownership from the government babus related with bill payment. In case any payment is misplaced or fail to get uploaded, the consumer will have to bear the brunt of paying late-fees or service interruption. Who will be responsible for that? BPS certainly sounds like an awesome plan to ease bill payment mechanism, but there are lots of clarifications which are required from the RBI. RBI is currently seeking general public comments on Draft Guidelines for Implementation of Bharat Bill Payment System. You can check it out here and incase you have certain specific and actionable comments, you can mail them to [email protected]. Thedraft guidelines are available here.